Roshuo asks Mai if humanity is even worth sacrificing oneself for. Kaito and Mitchi unleash their long simmering hate for each other. Mitchi asserts that he only wants to protect Mai, the only one worth saving. Kaito says Mai is strong enough to take care of herself. 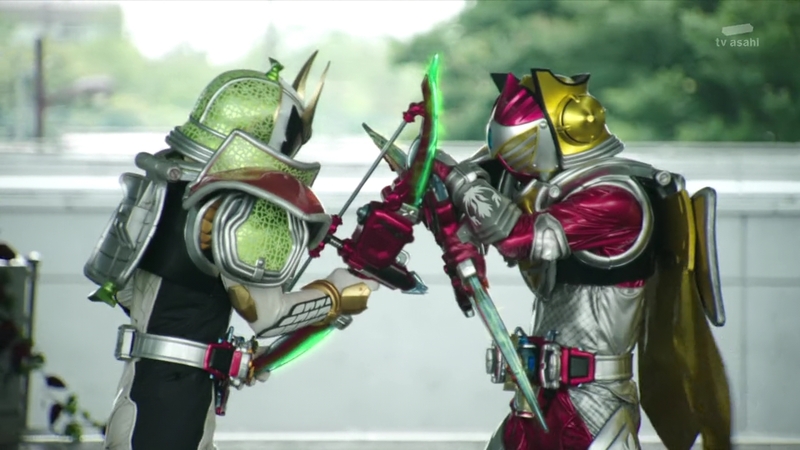 They force each other to de-henshin, but they continue fighting with just their fists. 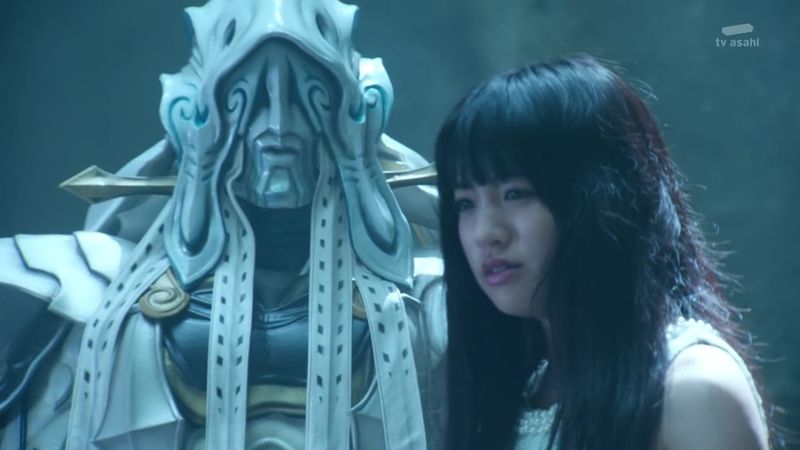 Ryoma suddenly comes over the loud speaker to announce that Mai is in Helheim with Roshuo, the Overlord King. Kota runs. 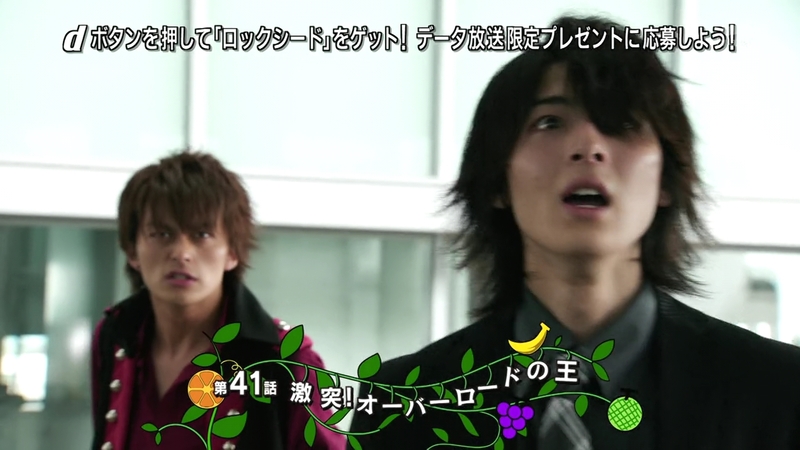 Mitchi can’t believe Ryoma could have found out. Suddenly, a very much alive Oren and Jonouchi jump in and hold Mitchi back, allowing Kaito to also run off to save Mai. Oren and Jonouchi laugh, but Mitchi has better things to do than deal with trash like them. He henshins and manages to take both of them on pretty easily. 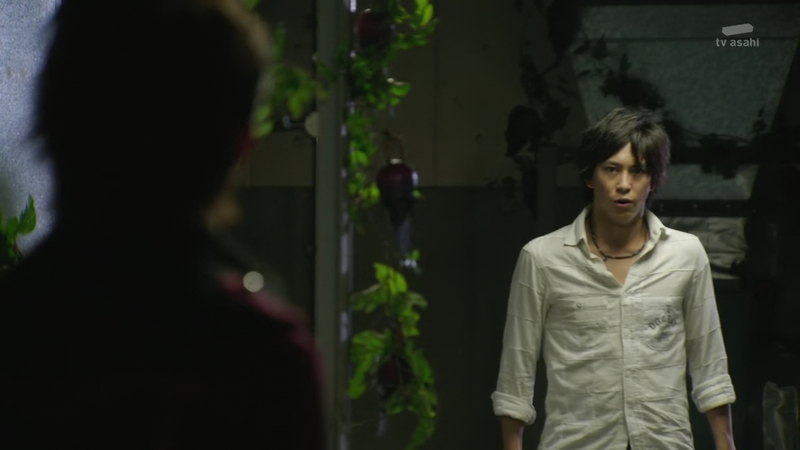 Meanwhile, Kaito catches up to Kota inside Yggdrasill. Before they go any further, Kaito makes sure Kota is fully resolved to see this all through. Of course, Kota says, he won’t hesitate anymore. 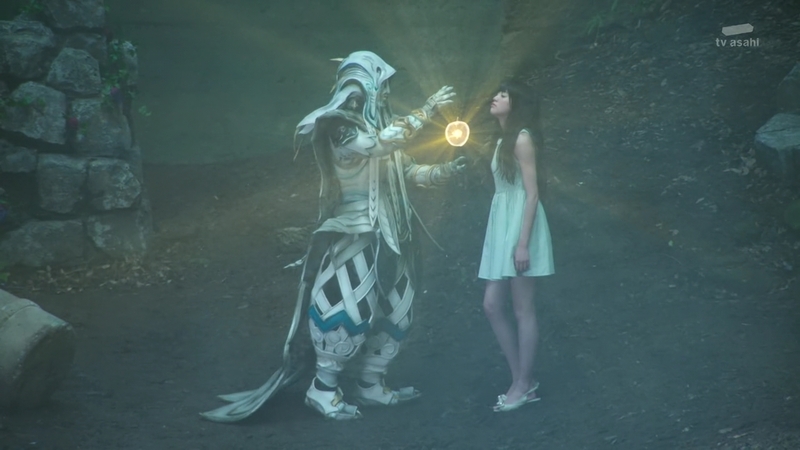 Over in Helheim, Roshuo tells Mai about wanting the Golden Fruit to help save the Femushinmu from extinction. But now he realizes it was all for naught. That’s why he’s keeping the Golden Fruit from them. Mai said it herself, this castle is empty. Indeed, Roshuo says he saved worthless lives and adopted foolish ideals only to lose everything, including his beloved. Even she must regret giving the Golden Fruit to him. You’re wrong, Mai says. It’s because of him wanting to save their people that she entrusted the Fruit to him. He turns to Mai and a flash, he remembers his beloved giving him the Golden Fruit and believing in his resolve and ideals. “So you say the same thing?” Roshuo inserts the Golden Fruit into Mai and tosses her back through a Crack. As the king, Roshuo says, he has one final task to carry out. Mitchi forces Oren and Jonouchi to retreat. About Mai, she’ll be fine with Roshuo. Not so fast, Redyue says. Mitchi must be pretty foolish to think Mai would be safest with Roshuo. If Roshuo takes a liking to her, he would never let someone like Mitchi near. HeadTakatora appears. Did Mitchi really think everyone would just do his bidding? 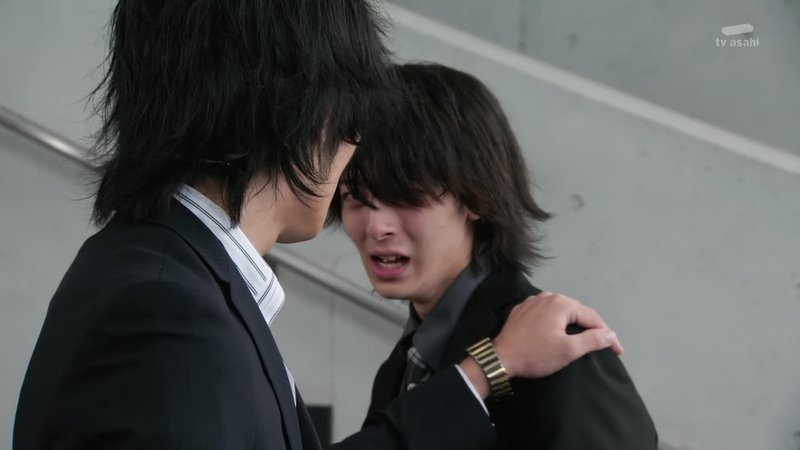 No one trusts Mitsuzane. Mitchi stumbles up the stairs, crying for Mai-san. Redyue is happy her chance may have finally arrived. Kota and Kaito find Roshuo who introduces himself. He tells them Mai has already been returned to their world. 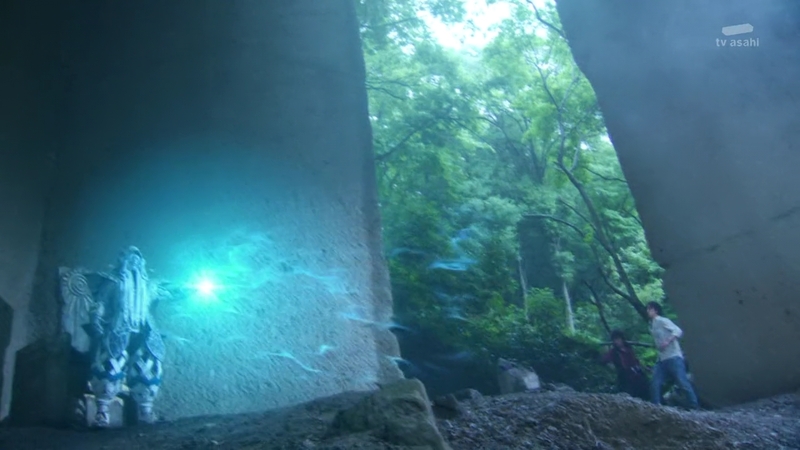 But now… Roshuo uses his powers to pin Kota and Kaito against the rock wall as he flashes the Golden Fruit. It’s time for them to battle so Roshuo can see their true power. Kota and Kaito both henshin, Kota to Kachidoki Arms. Ryoma excitedly watches, invisible. Roshuo simply waves his hands and Kota and Kaito go flying all over the forest. He blocks all their attacks and easily controls the forest to help with his own attacks. Nothing Kota and Kaito do even leaves a dent. 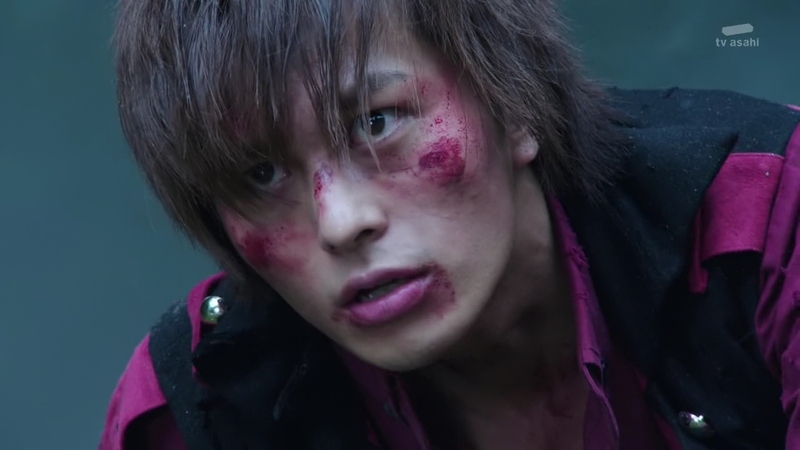 Kaito exerts all the energy he can to push back against Roshuo, but Roshuo just swats him away, forcing him to de-henshin, now all bruised and bloodied. 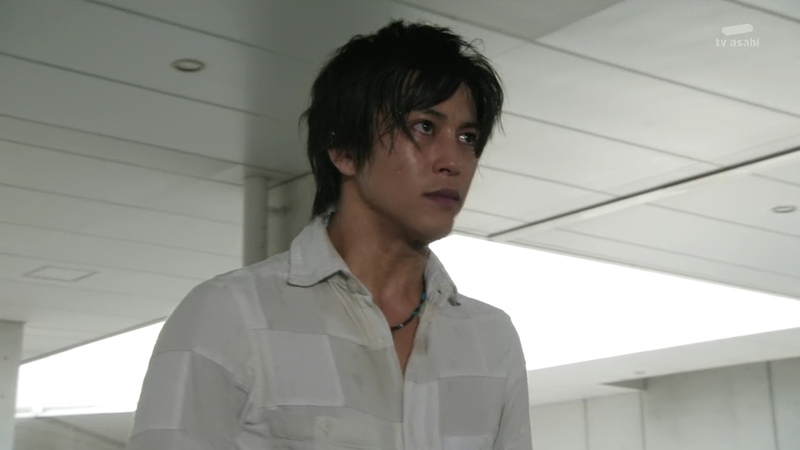 Kaito wants to continue fighting, but the pain in his Helheim-infested arm wound flares up in a bad way. 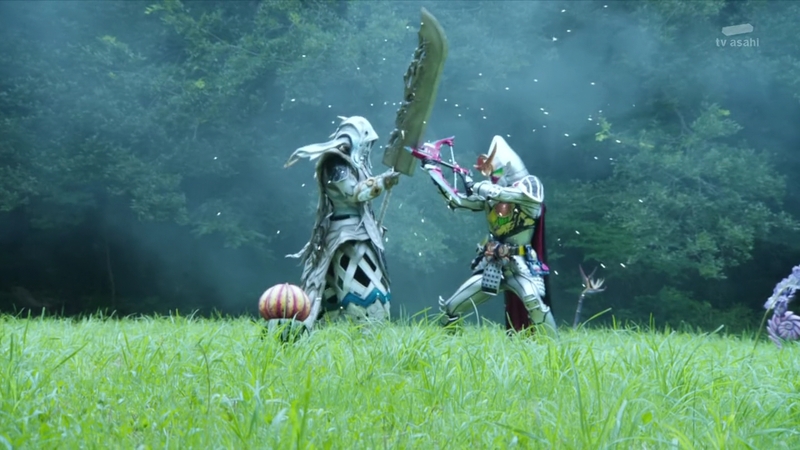 Roshuo is about to put him out of his misery, but Kota shoots at Roshuo’s huge sword. Roshuo turns his attention to Kota who tries taking a few swipes at him only to see Roshuo’s wounds instantly heal. He takes Kota out to a clearing. Kota pulls out the Kiwami Lock Seed, but Roshuo asks if he is sure he wants to use that. As a fragment of the Golden Fruit’s power, every time Kota uses it, it chips away at his humanity. And that’s only a fragment of what the Golden Fruit can do. What will having the Fruit itself be like? Roshuo takes the Golden Fruit out and instantly creates a field of Inves. This is its power, it has the power to create life! It allows you to change the world into whatever you want, the power of the gods! Roshuo asks if Kota really has the resolve to own this intense power. Kota fights off the Inves and Roshuo-controlled vines. Kaito is amazed even more by the Golden Fruit. He knows just what he would do with it. 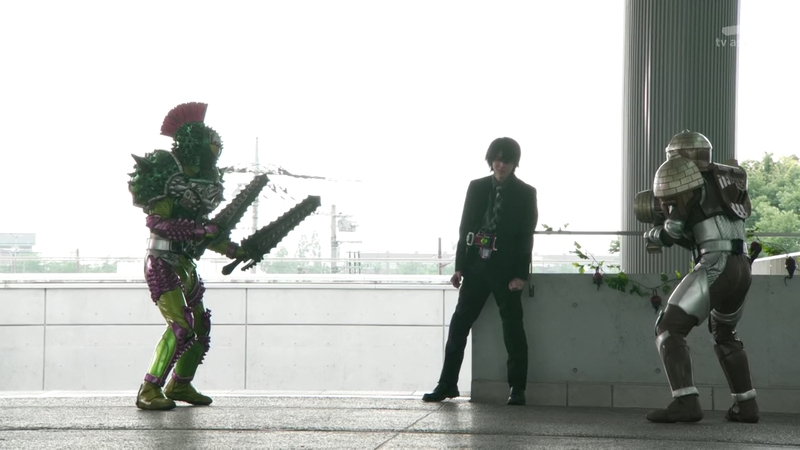 But Kiwami Kota is still no match for Roshuo who slashes at the Lock Seeds and belt, forcing Kota to de-henshin. The Lock Seed is fried. “I have seen your resolve,” Roshuo starts to say. But just then, a shot pierces Roshuo’s back. It is from Redyue. Redyue is excited that the Golden Fruit is now hers. She reaches into Roshuo and pulls it out. But the Fruit suddenly turns rotten. It’s a fake! She kicks, beats and stabs Roshuo, demanding to know where the real Fruit is. Kota gets up, angered by this display. 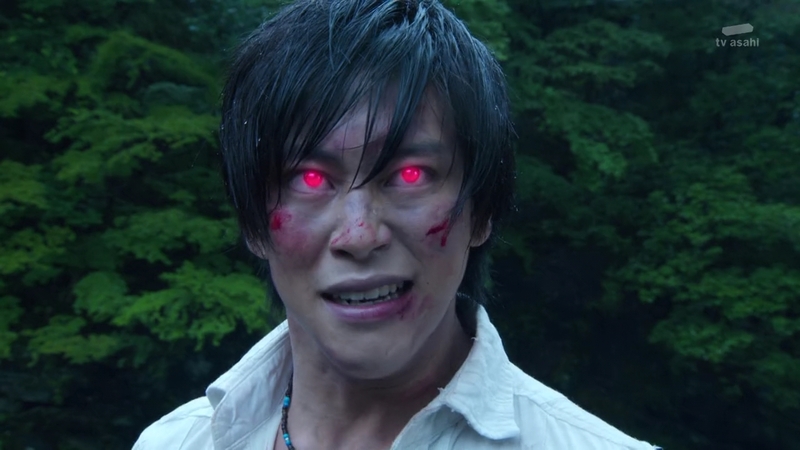 His eyes glow red and the previously fried Kachidoki Lock Seed is now as good as new. 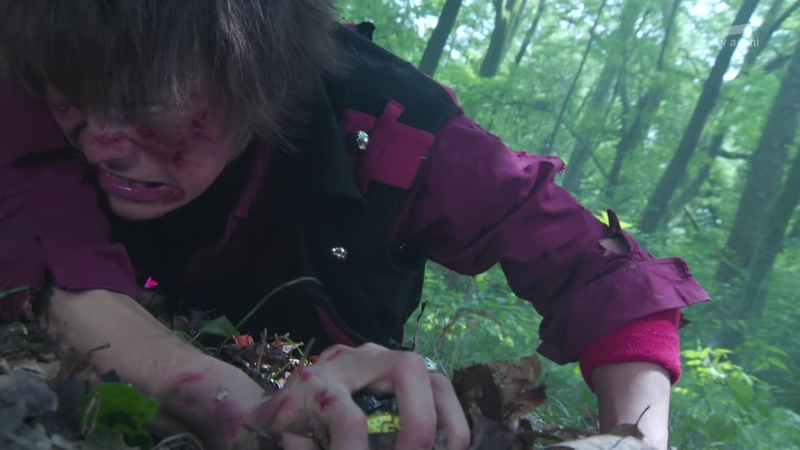 Kota henshins directly to Kiwami Arms and fights Redyue, now able to use the forest to his advantage as well. 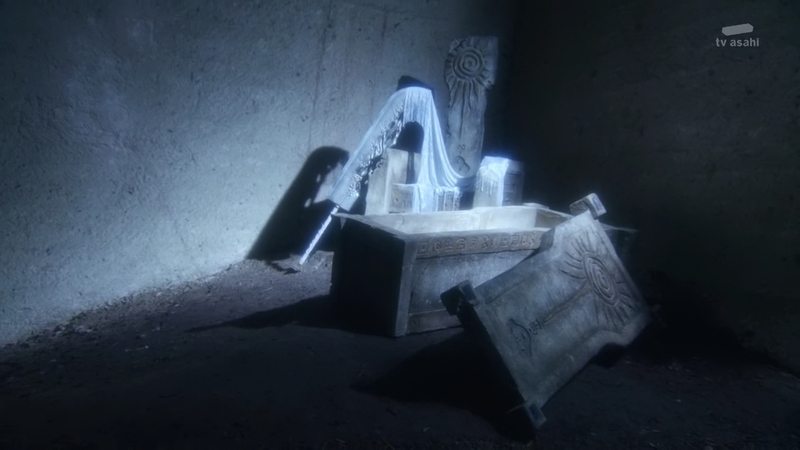 “Kazuraba, you’re already… an Overlord,” Kaito says. Kota grabs Roshuo’s big sword and uses it to knock Redyue into the water before flipping out the Hinawadaidai-DJ-ju for a Fruit Basket finisher that finally gets rid of her. Mitchi has watched this whole thing. WTF is happening?! He thinks about where Roshuo could have possibly hidden the Golden Fruit. MAI! He runs to his Mai-san. Ryoma realizes this possibility as well. But she opens her eyes and her right one glows red. 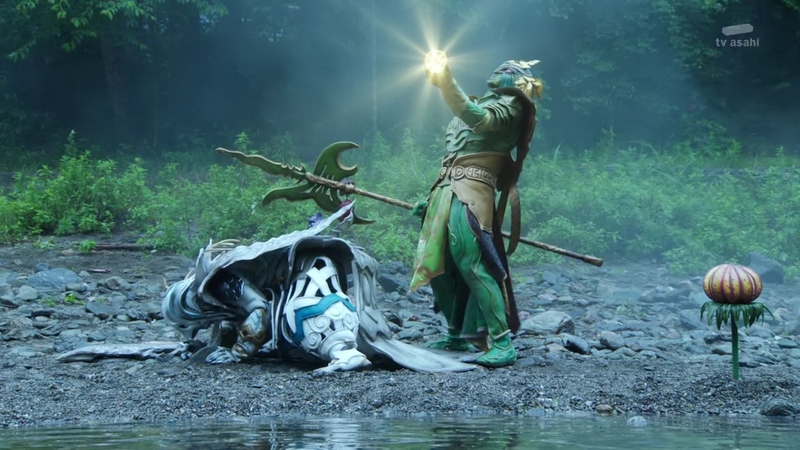 Back in Helheim, Sagara walks toward Roshuo’s lifeless body. The Femushinmu are now all extinct, he says. Sagara says it’s not for him to decide, they must decide for themselves. The Queen dissolves into white sparkles. 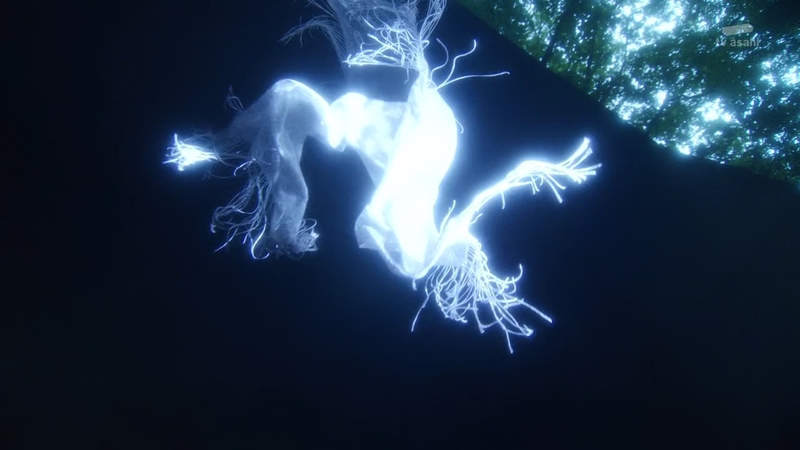 Her necklace, inside the tomb coffin which is now open, glows as a white scarf falls from the sky. It’s getting close. The end is definitely near. And by “the end,” I mean when all sh*t hits the fan. Like it hits the fan and it just goes splatter everywhere; a wasteland of emotions, of friendships, of ambition, of thirst for power, of rotten fruits. Just everything. I definitely did not expect Redyue to go bye bye this episode and definitely not by the hand of a magic Lock Seed. I guess I was expecting Redyue to make a lot more waves before she eventually bit the dust, but she really didn’t. Especially when Roshuo appeared resigned to the fact that his own life was coming to an end anyway after he gives Mai the Golden Fruit. At the same time, Roshuo’s body still exists. 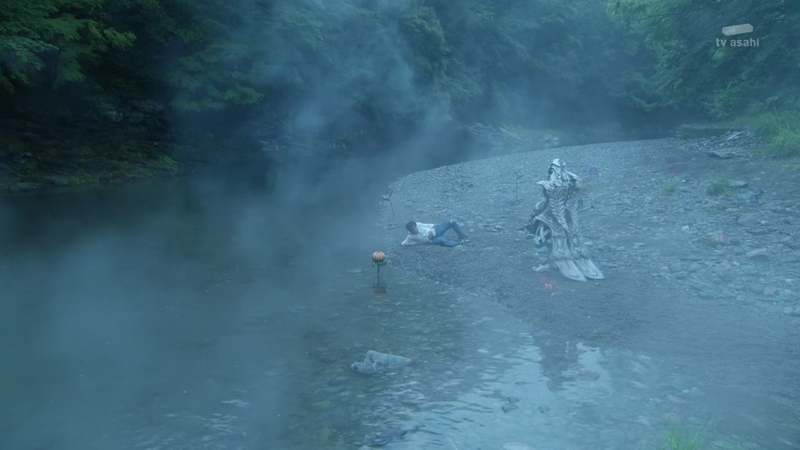 He’s just lying by the river even though his Queen is happy to finally be able to spend time with him. But the coffin in the tomb was completely open, not like before with only a crack for some tubes. Did Roshuo open it up and free her or something? But how about those red eyes eh? So we’ve already come to expect Kota and Kaito becoming Overlords. I’ve definitely talked about the parallels between Kota & Roshuo, Mitchi & Redyue and Kaito & Demushu. 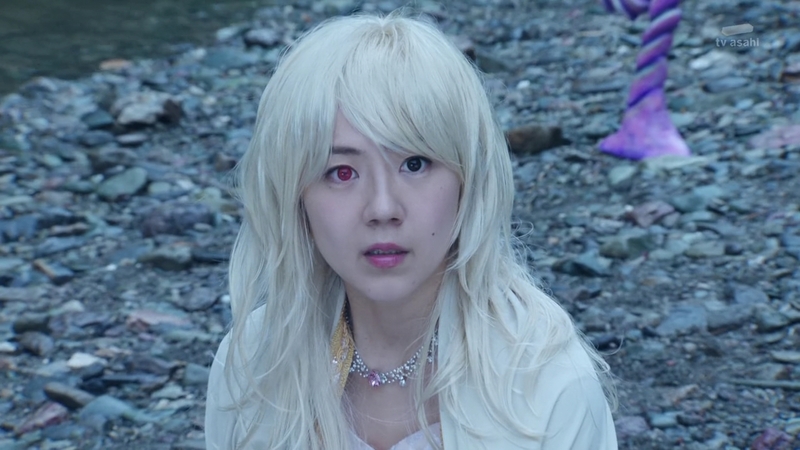 But now we see Mai and her Helheim counterpart, perhaps, in the Queen. Mitchi dressing Mai in white now just goes along with what appears to be fate and destiny. The Golden or Forbidden Fruit has definitely set the religious undercurrent on the show. So if we’re going with that, where does that place Mai, Kota and Sagara the snake? Next episode is Mitchi’s Last Transformation. Well damn. I hope not! Just 6 (or 5) more episodes left though! It is definitely not going to let up from here.